Extreme ultraviolet (EUV) lithography is moving closer to production, but problematic variations—also known as stochastic effects—are resurfacing and creating more challenges for the long-overdue technology. GlobalFoundries, Intel, Samsung and TSMC hope to insert EUV lithography into production at 7nm and/or 5nm. But as before, EUV consists of several components that must come together before chipmakers can insert it. These include the scanner, power source, resists and masks. And more recently, the industry has begun sounding the alarm about stochastics, a phenomenon that involves random variations. Some components are ready, while others are lagging. In fact, the EUV community for the first time has listed photoresists and related issues as the top challenge for EUV, surpassing the power source. After years of delays, the EUV power source finally meets the specifications for high-volume manufacturing (HVM). The resists, which are light-sensitive polymers used to create patterns, are a different story and are among the culprits that cause stochastics. By definition, stochastics describe events that have random variables. They are unpredictable and without a stable pattern. Stochastics are not new. In fact, the phenomenon has haunted the EUV community for years. It is widely known that stochastics can cause variations in printed patterns. The industry has been working on the problem, but it either underestimated the issues, didn’t address them soon enough, or both. What’s new is that the industry is finally coming to grips with another problem. A leading-edge logic chip incorporates a billion or more tiny contacts. If there is a mishap in the EUV process, the chip could suffer from stochastic-induced failures or defects. In other words, a chip can fail with a defect in just one contact. Regardless of the nodes, EUV stochastics present headaches for chipmakers, fab tool vendors and the IC design community alike. “From a design point of view, the stochastic effects are truly random in that you can’t predict the location and amount of variation. Therefore, there is no systematic way to say that a particular layout feature should be modified in one area/placement of the layout verses another. In other words, there is no way to compensate for the effect during design other than avoiding all occurrences of sensitive features which translates into traditional design rule constraints,” said David Abercrombie, DFM program director at Mentor, a Siemens Business. • Vendors are improving the EUV resists. • Applied Materials and ASML are developing a new class of e-beam metrology tools that promise to detect stochastic defects. Additionally, startup Fractilia has devised a way to help measure them. • Then, with this new metrology data, chipmakers are asking competitive fab tool vendors to cooperate and help put the information together. Chipmakers need EUV because it’s becoming more difficult to pattern the tiny features using today’s lithographic techniques. Initially, chipmakers will extend today’s 193nm immersion lithography and multiple patterning to 10nm and 7nm. These techniques work, but it’s becoming more challenging to use them for select features. So chipmakers initially hope to use EUV for the contacts and vias in devices. They will continue to use immersion/multi-patterning for the other portions. To process contacts/vias, it requires two to four masks per layer for today’s processes at 7nm, according to GlobalFoundries. With EUV, though, it requires only one mask per layer. The insertion of EUV depends on the readiness of the technology. Today, ASML is shipping its first production EUV scanner, the NXE:3400B. The 13.5nm wavelength tool has a 13nm resolution. The EUV scanner can print fine features, but for years the EUV power source didn’t generate enough power. This impacted the overall throughput of the system. Now, ASML is shipping a 246-watt EUV power source, enabling a throughput of 125 wafers per hour (wph). This meets the HVM target levels. Additionally, EUV pellicles aren’t ready. “The pellicles are making progress. The transmission is still fairly low, but we’ve demonstrated that those pellicles can survive up to 245 watts. In off-line tests with some newer materials, we think they can even go above 300 watts,” Lercel said. The resists are another challenge. For years, the industry has used chemically amplified resists (CARs) in 248nm and 193nm lithography. In simple terms, a lithography light source generates photons or particles of light. The photons hit the CAR, generating an acid. Then, the CAR undergoes an acid catalyzed reaction during a post-exposure bake process. Another way to explain the problem is the system exposes the resist to EUV light, sending a certain number of photons into the resist. Ideally, those photons would be evenly dispersed. But 10 photons might get absorbed into the resist in one spot, while in another location 8 photons are absorbed. This unwanted result is known as stochastics. Then, in another example, let’s say EUV light hits the resists in three consecutive and separate events. In the first event, the resist absorbs 10 photons. Then it absorbs 9 the next time, and 11 after that. The variability from one event to the next is a phenomenon called photon shot noise. If one plots these events on a curve, the distribution of the photons is sometimes undesirable. “As we go to smaller and smaller feature sizes, what we find is that the Gaussian distribution starts to grow a tail and become asymmetric on one side. This growth of the tail leads to the increasing probability of highly unlikely events,” McIntyre said. Years ago, stochastics and shot noise were not on the radar screen, but the issues began to appear in 193nm lithography. In 193nm, chipmakers use a dose of 10mJ/cm² near the edge of a feature. “If I take a 1nm² area, then over the course of that exposure, 97 photons on average will pass through that area and go into the photoresist. But if I look at this larger volume of 10nm² on a side, I will have 9,700 photons on average,” explained Chris Mack, CTO of Fractilia. So, with an ample number of photons to process a feature, the photon shot noise or variation amounts to only 1%, according to Mack. Compounding the problem is the fact that feature sizes are smaller at each node. You can count the number of photons in the process. At that point, the variations escalate exponentially. This isn’t new. For years, Mack and others have warned that EUV stochastics can cause unwanted line-edge roughness (LER) in patterns. LER is defined as a deviation of a feature edge from an ideal shape. LER can impact the performance of a transistor. In addition, LER doesn’t scale with the feature size, so it takes up a larger percentage of the pattern at each node. These defects are catastrophic. “A contact hole is a little spot where you are going to put some photons. But if you only have a few photons, sometimes the contact hole gets 100 photons, sometimes it gets 80, and sometimes 140. The result is variation of the size of the contact holes,” Mack said. These defects might crop up at 7nm, but they will likely surface at 5nm and beyond. “The stochastic effects in EUV essentially add a random variation over the normal dose/focus window in CD control as well as additional line-edge roughness and shot-to-shot dose variation. For the process guys this means less process window, which translates into larger DRC rules and less process shrink,” Mentor’s Abercrombie said. One way to solve the stochastic problem is to use a robust EUV resist. Ideally, chipmakers want a dose at 20mJ/cm². With a 250-watt source, this dose would achieve a throughput of 125 wph. The 20mJ/cm² resists are not ready for 7nm—yet. 5nm is up in the air. So, the industry has made some compromises. At 7nm, chipmakers will use a CAR-type resist with dose at 30mJ/cm² to 40mJ/cm². 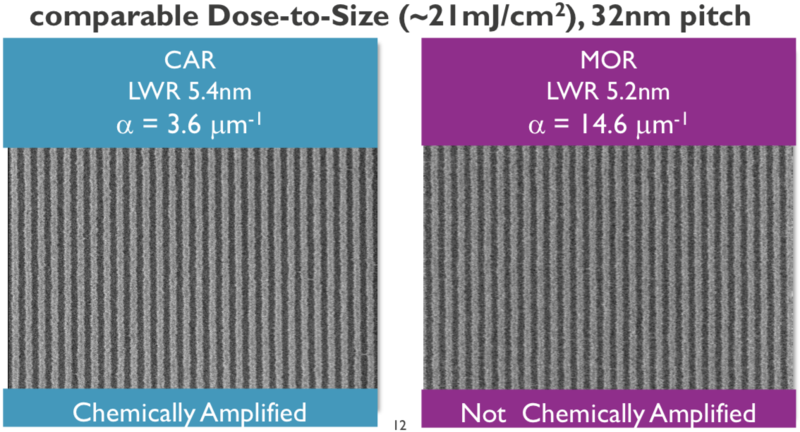 These doses provide good resolution, but they are slower and impact the throughput of EUV. Chipmakers seem to get good yield with resists with doses between 30mJ/cm² and 40mJ/cm². With a 30mJ/cm² dose, an EUV scanner with a 250-watt source has a throughput of about 104-105 wph without a pellicle, according to ASML. This is below the desired 125 wph target. So what’s the solution in the future? One way is to boost the power source to 500 watts or 1,000 watts, suggested Yan Borodovsky, formerly a senior fellow at Intel. (Borodovsky recently retired from Intel). That way, you can use a higher dose and ensure yield. But 500-watt (or more) sources are still in R&D. There are several variants of CARs. One candidate is a CAR with metal sensitizers. Metals have higher photo absorptions. “You can have a rather significant improvement in the behavior of CARs by putting in the right metal,” said Christopher Ober, a professor of materials engineering at Cornell. Then, JSR, TEL and others are developing another variant called photo-sensitized CAR (PSCAR). For this, the mechanism releases an acid. Then, it triggers a photo-sensitizer. “Then, you can do a flood exposure and that leads to higher performance imaging,” Ober said. Meanwhile, startup Irresistible Materials is developing a multi-trigger CAR. Besides CARs, Inpria is developing metal-oxide EUV resists, based on tin-oxide nanoclusters. “The theory on metal-oxide is sound. You capture more photons and there are higher densities for shot noise,” Lam’s Wise said. Besides resists, the industry faces another challenge. How do you ensure good yield with a chip that incorporates a billion or more contacts? Metrology, the science of measuring chips, is the first step. In the fab, chipmakers initially use a CD-SEM. But the CD-SEM is limited to 10,000 features per measurement, meaning it may be unable to detect all stochastic-induced defects. To help solve the problem, Applied Materials and ASML are adding metrology capabilities to their e-beam inspection tools. They will incorporate CD-SEM and overlay capabilities to the mix. CD-SEMs and related tools can encounter signal-to-noise issues, causing a problem called CD bias. To solve that problem, Fractilia has a software tool capable of measuring LER and contact failures. The tool separates the errors of the CD-SEM and the lithographic features. For EUV metrology, optical CD (OCD) is another possibility. Then, chipmakers must also locate the defects using wafer inspection tools, such as brightfield. “With EUV, the defects are more random, and that’s a big challenge,” said Neeraj Khanna, senior director of worldwide customer engagement at KLA-Tencor. With so many different tools in the fab, that might not be enough. So chipmakers are asking their metrology and other tool suppliers to work together and help sort out the data. It’s unclear how that will work, as “there is no open framework to do this,” according to one chipmaker. Still, the industry must cooperate. Otherwise, EUV insertion may become more difficult with even more stochastics to deal with. Of course the distribution develops a “tail”. It is not a Gaussian distribution, it is a Poisson distribution which is only approximately Gaussian for large numbers of photons. Hi Gregg. Thanks for the clarification.